Jerusalem (AFP) - Until recently it took Abu Amr four minutes to drive his son to school. 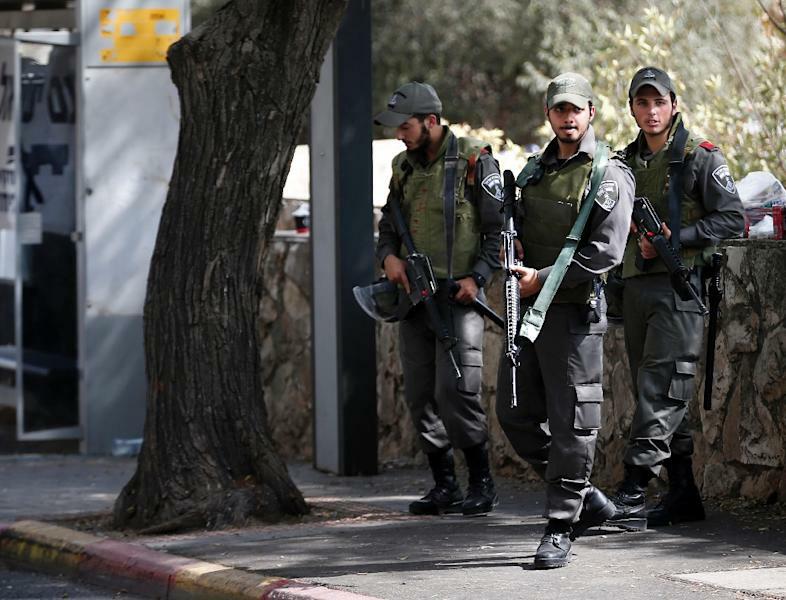 Now, because of security checkpoints aimed at combating a wave of attacks on Israelis, it takes 40. Concrete blocks and partitions have been set up around his Palestinian neighbourhood of Jabel Mukaber, which came under the spotlight earlier this month when police said the killers of three Israelis were residents of the area. 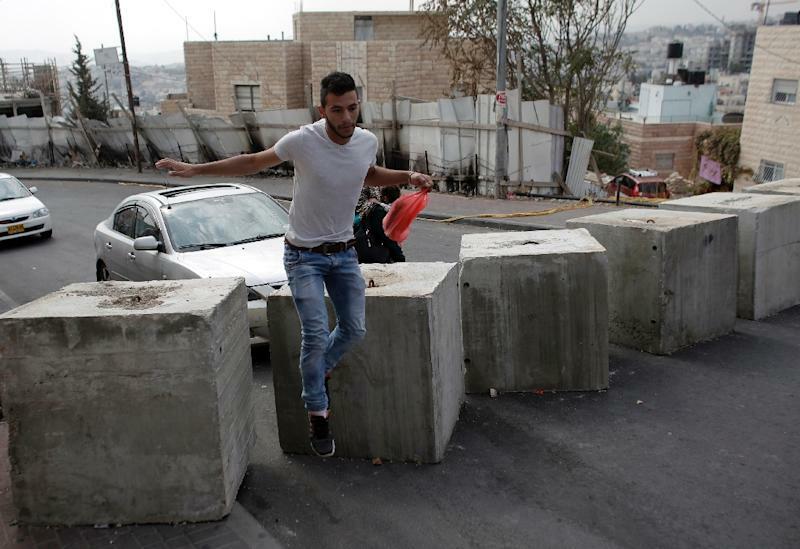 To pass through these new obstacles in occupied east Jerusalem, Abu Amr must abandon his car and go on foot, but only after identity and other checks. Men must lift their shirts to show they are not carrying a weapon or a bomb. Women must open their bags to be searched by police. Responding to attacks in which eight Israelis have died so far this month, Israeli security forces have deployed into Palestinian areas and erected obstacles to control residents' movements. The United Nations says that 38 barriers, including 17 checkpoints, have sprung up in nine Palestinian neighbourhoods, disrupting the daily lives of at least 138,000 Palestinians. On a recent day, Abu Amr, 34, needed to pick up the boy from school and take him to a doctor's appointment. He was running late and fuming at "the collective punishment which is the manifestation of the racist discrimination" by Israel in east Jerusalem. The mainly-Arab eastern sector was seized by Israel during the 1967 Six Day War and later annexed in a move never internationally recognised. Since the beginning of October, Palestinian-Israeli unrest has spiked across the occupied territories but it is in east Jerusalem where Palestinians "pay the highest price," Abu Amr says. The Israelis "believe that the solution will be imposed by force, but more force will only bring more violence," he adds. Jabel Mukaber was home to three Palestinians who allegedly killed three Israelis in two separate attacks in Jerusalem before being killed by security forces. 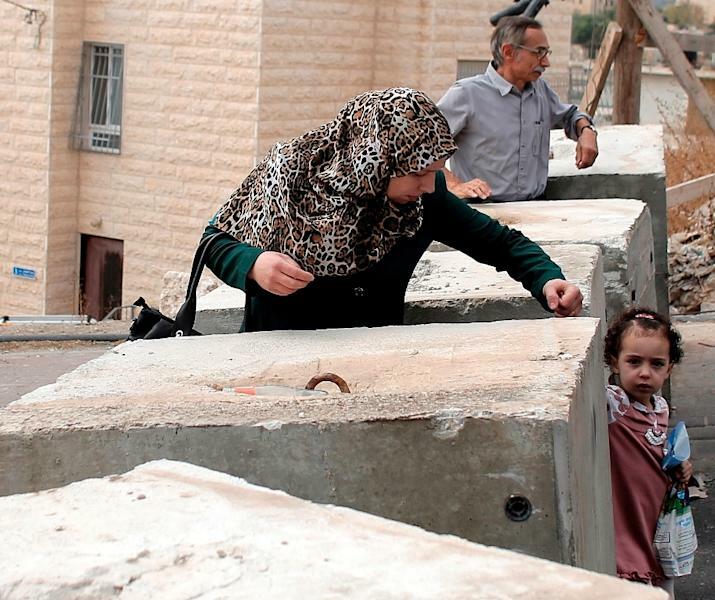 Israeli authorities started building a wall there this week to create a buffer for an adjacent Jewish neighbourhood where "there is a history of stone and firebomb throwing at Jewish homes and cars," the municipality said. Work on the barrier, which was to have run for 300 metres (yards), soon ground to a halt amid internal Israeli political squabbles but Palestinian residents remain fearful. "What do they want to do with the wall if not to isolate our neighbourhood?" asks Tareq Auissat. The 24-year-old bus driver says that the section already erected stops him taking passengers more than 500 metres. "I drop them at a checkpoint then they take another bus," from the other side to east Jerusalem's city centre. "Normally the journey takes 25 minutes," he adds. "Now with the roadblocks and searches you need to allow an hour or 90 minutes." In the Issawiya neighbourhood stand identical concrete blocks and armed soldiers block all roads in. "Every day we're late for university or school," says 19-year-old student Mumen Rabi. "We're late for everything. It's a punishment inflicted on all the residents of Issawiya." It comes, locals say, on top of decades of discrimination and marginalisation of Palestinians in Jerusalem, where more than 300,000 of them live. Construction is almost impossible because building permits are issued by Israel in a trickle, while demolition of unlicenced Palestinian homes increases. Among them live 200,000 Israeli settlers, encouraged to build because Israel considers Jerusalem as its "eternal and indivisible capital". The Israeli municipal council officially manages all of the city but its services actually stop at the edge of the Palestinian neighbourhoods. The Palestinians living there are almost entirely designated as residents rather than citizens. They do not have the vote in national Israeli elections nor do they hold Israeli passports, travelling instead on documents issued by neighbouring Jordan. "We pay taxes... but no one is interested in us," says Abu Amr. "Infrastructure in the east (of the city) is zero! We have no social care, no education, no development, no economy. We don't have job security either." Mohammed Abu al-Homos, a member of the Issawiya neighbourhood council, points to the street sweepers busy at work in the neighbouring Jewish colony of French Hill. "Here, they do nothing at all, while there, they clean the pavements." Palestinian cartographer Khalil Tufakji says the two sides of the holy city occupy parallel universes. "West Jerusalem lives in the 21st century, but east Jerusalem is stuck in the 15th century,' he tells AFP. To move from one side to the other, he says, is to cross "a cultural divide". "One passes from one world to another which is totally different."